30 The Phoenix Pecan Model | 4 Bedroom + Den or 5 Bedroom 2.5 Bathroom | 3,851 Sq Ft | 3-Car Garage | $1,475,000 maybe pieces they already have won’t work with the space without major modifications. Maybe they can live with that…Maybe they keep looking. How do you know when to stop? Hmm…It’s not easy. At some point though you just need to say, “This is good. This is great, let’s move on.” I walk into spaces I’ve designed all the time and wish I could do something differently. You can always change things, like I did with my room as a girl, but eventually you just get a sense for the place, and if I add something, it won’t make it better, if I subtract something it won’t make it better either. It takes practice, but that’s how I know I’m done. 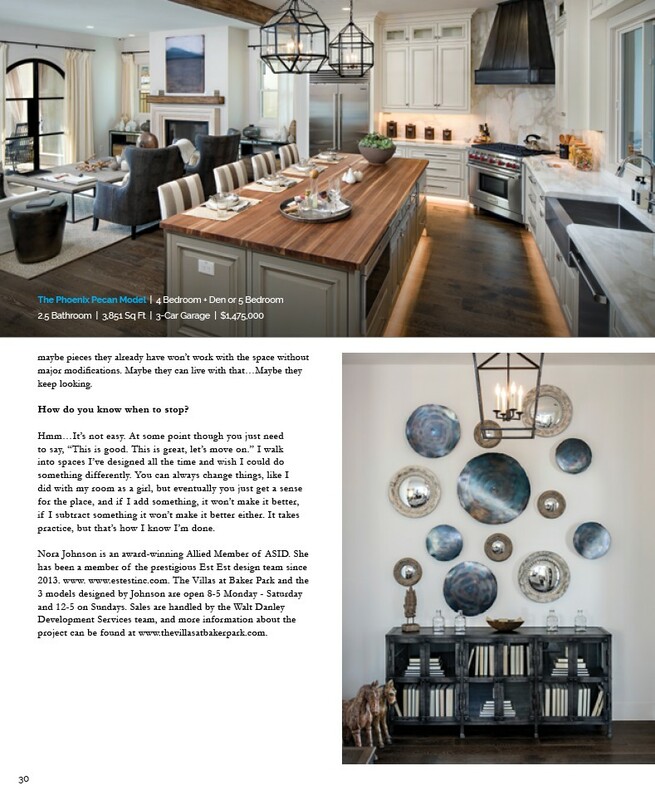 Nora Johnson is an award-winning Allied Member of ASID. She has been a member of the prestigious Est Est design team since 2013. www. www.estestinc.com. The Villas at Baker Park and the 3 models designed by Johnson are open 8-5 Monday - Saturday and 12-5 on Sundays. Sales are handled by the Walt Danley Development Services team, and more information about the project can be found at www.thevillasatbakerpark.com.